At the 2017 HLPF, Jordan became the third country from the Arab region to participate in the VNR process; following Egypt and Morocco in the 2016 review. The first words of Jordan’s national report made reference to the same issues: ‘the power of working together’ and taking into consideration ‘the urgent world issues’. Yet, as in many parts of the world, the Arab region lags behind in the implementation of the Agenda 2030; structural challenges on social, economic and political levels continue and inequalities continue to widen. The Arab States lack road maps for implementation and are still trying to identify ways and means to integrate the three pillars of Sustainable Development in their institutional structures, national plans, and budgets. As the Ministerial Declaration adopted at HLPF reaffirms, the pace of implementation must be accelerated. With regard to implementation, the Declaration calls for a stronger commitment to partnership and cooperation, strengthening international cooperation that supports policies and programs to increase public and private, domestic and international investment in sustainable development. Indeed, most of the discourse regarding the achievement of sustainable development, following the adoption of Agenda 2030, relies on the private sector, giving an increasing role to the private sector in development (investments on infrastructure), promotion of public-private partnerships (under multi-stakeholder partnerships), and using public finance to attract private investments through blending mechanisms. However, as the Spotlight on Sustainable Development 2017 Report states; the trends showing the private sector as the most efficient way to provide the necessary means for implementing the SDGs constitutes a challenge. The approach should be revised, public policy space should be reclaimed, and transformative measures should be adopted to strengthen public finance. Moreover, promotion of PPPs should be well assessed, as they can exacerbate inequalities, decrease equitable access to essential services, and jeopardize the fulfillment of human rights. The private sector in the Arab Region has a significant share of several countries’ GDP (i.e. 80% in Lebanon, 60% in Egypt), occupying industries like construction, trade, and tourism, as well as other services sectors like banking and finance. Similarly, PPPs are long promoted in the region, including by international financial institutions (i.e. IMF advices) and by partners like the European Union. Nevertheless, concerns remain same; without safeguard mechanisms and an effective regulatory framework, they fail to improve public services and can rather result in price hikes and in violations to the full and inclusive enjoyment of rights, especially in sectors that supply citizens with basic needs (e.g. water, education, etc.). Unlike the private sector, the Ministerial Declaration omits mentioning civil society, referring it only once, which is very much in line with the current situation, including in the Arab region, namely, the shrinking of civic space. 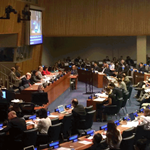 Nevertheless, civil society was present at the HLPF and organized side events to raise their concerns. ANND’s delegation to the HLPF was formed of civil society representatives from Lebanon, Jordan, Egypt, Palestine, and Morocco. Delegation members noted that civil society was sidelined, including during the HLPF, attending key thematic reviews but not given any floor to raise direct concerns. Peer-reviews ended up congratulating minor steps taken on the way to SDGs implementation. An inclusive approach to civil society at HLPF is key and the outcome document should have openly reaffirmed this. Given that localization of the agenda and adoption of comprehensive national development strategies are lacking in many countries in region, severe restrictions have been imposed on civil society on various levels, be it the freedom of association, assembly or expression. We affirm the 4th paragraph that mentions people's right to self-determination and ending occupation. In the same context, we must point out that the ongoing Israeli occupation does not only affect the Palestinian people's right to self-determination but also the entire Arab region. In such a context, the transformative nature of Goal 16 makes it powerful and its implementation vital. This requires significant shifts in all interlinked aspects of the Goal: peace should be positive, accountability should be mutual, inclusive societies require the adoption of new social contracts, and justice must be comprehensive including social, economic, environmental, cultural and political justice. In addition to this, the commitment to SDG16 should be further strengthened together with the resources allocated to development financing, rather than military spending and investments. The Declaration stresses that climate change is one of the greatest challenge of all, but we should note that developing countries and their most marginalized groups are not only extremely affected by climate change, but also require an exchange of knowledge and technology to reduce emissions and produce clean energy in order to fulfill their commitments towards the Paris Protocol. Improved commitments, genuine implementation, monitoring and enforcement tool for climate goals are necessary. Arab, nations-especially with most of the population in coastal areas and dependent on farming in saltwater-adjacent lowlands-should be spearheading this effort. The Declaration continues to promote a universal, rules-based, open, transparent, predictable, inclusive, non-discriminatory, and equitable multilateral trading system under the World Trade Organization, as well as meaningful trade liberalization. Thus, the long call of Southern governments for the need to review, amend, and reform international organizations and agreements in the fields of trade and investment in order to ensure the fulfillment of people's right to just agreements and equal rights is simply not heard. On the other hand, the Declaration misses several key issues, including austerity measures and neoliberal economic policies imposed and promoted by International Financial Institutions (IFIs) and the importance of reducing tax evasion and tax havens that deprive developing and poor countries from resources necessary to finance development. Indeed, IFIs policy advice directed to the region remains a key challenge to development and is not put under any review within the HLPF process for its impacts on SDGs implementation.